Maximum size: 14 mm (Kay, 1979). Identification: This is a small species that rarely exceeds 8 mm in length. It has a cream body with orange spots. 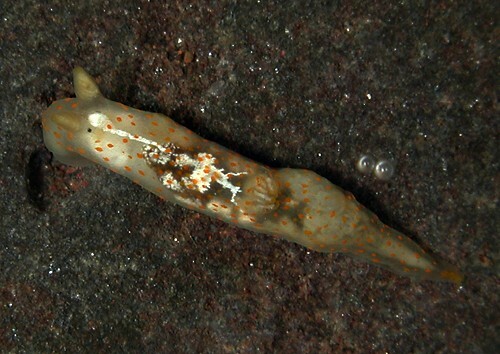 The rhinophores are rod-like when fully extended and there is a white patch between the eye spots that connects to irregular white patches near the gills. The rhinophores and gills are usually tipped with orange. The rod-like rhinophores and less prominent white pigment posterior to the gills distinguish it from young Gymnodoris okinawae. Natural history: Gymnodoris sp. #6 is a moderately common species found in moderately exposed to exposed rocky habitats and Halimeda kanaloana beds from < 1 to 15 m (< 3 to 50 ft). It appears to feed on small Elysia spp. (Note 1) It lays a small, bright orange egg mass that hatches in about eight days in the laboratory. Taxonomic notes: This is the species that Kay, 1979 as well as Kay & Young, 1969 list as Gymnodoris plebeia (Bergh, 1877a). It was first reported from Hawaii in Kay & Young, 1969. Photo: CP: 6.5 mm: Hekili Point, Maui; Oct. 30, 2007. Note 1: On Nov. 21, 1995 we observed one regurgitate an unidentified Elysia. Over the years, one each of three Elysia spp (Elysia pusilla, Elysia sp. #2 and Elysia sp. #6) have "disappeared" while held in dishes with this species. On Dec. 8, 2003, we observed one eat an Elysia pusilla engulfing it rapidly "on contact." On April 10, 2013 a 7 mm animal that had been held without food for four days was offered a 5 mm Thuridilla kathae. On first contact, it ignored the Thuridilla. On second contact, it everted it's oral tube but "backed off" leaving the Thuridilla unharmed. On third contact, it ignored the Thuridilla. It was then offered an Elysia sp. #6 about 4 mm in length. It engulfed and consumed the latter rapidly on first contact.